When is the last time you really felt beautiful? The last time you looked in the mirror? Or do you even look in the mirror anymore? Was it on your wedding day? When you were a little girl and pretended to be a princess? Or maybe, sadly, you’ve NEVER felt beautiful? I’m Trisch and I remember that feeling all too well: unhealthy, overweight, tired and no energy to keep up with and enjoy my wonderful family. I’d like to share with you my transformation–inside and out–and how I feel truly beautiful, younger, healthier, and more energetic than I have in 20 years! That’s what I wailed to my precious husband just after New Year’s Day, 2007! I had had my ninth child and he was nearly 4 months old. I looked and weighed like I did the day before he was born! I had had a c-section with him, so it took me a little time to work back up to my exercise routine. I was doing a mixture of core strengthening exercises, cardio and flexibility for 45 minutes to an hour a day. And I was tired! An hour and a half later I would need a nap! I kept being faithful to this, but after a few months of losing absolutely nothing (and, in fact, gaining 10 lbs.! ), I was discouraged. To say the least! That’s when the above quote was said! Now, let me also say here, I hated exercise videos! Several ladies from my church were doing “T-Tapp”, but I had no interest whatsoever in a workout dvd. 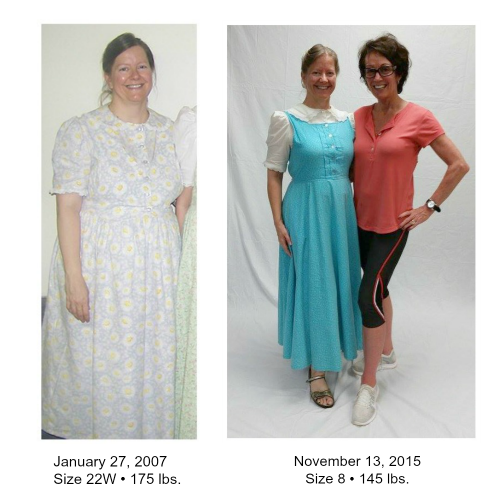 Until my friend told me, during my discouragement of losing absolutely nothing, that she had lost 15 inches in three weeks! I was intrigued and happy to learn there was no music (music actually distracts me), and I decided to do some research. I got the book out of our library and started doing the exercises from the book–not an easy way to start! I think the 15 minute workout took me 1 1/2 hours! But I started losing inches! I was EXCITED! Another friend loaned me her BWO+ dvd while I saved for my own, and the rest, as they say, is history! Now, my journey hasn’t been without its bumps and detours! During the past 10 years I have been through the loss of my parents, my remaining grandparents, all nine children getting chicken pox at once, a miscarriage, an adrenal crash, taking care of my mom’s affairs after her death, hubby’s open heart surgery….not exactly a walk in the park! Yet I was able to continue T-Tapp, needing to take time off from time to time, but still able to do this workout–yes, even after my adrenal crash! I am still adrenal “challenged”, as I like to say, but I have been able to focus on health and still see my body lose inches and reshape in ways I never thought it would after years of being overweight. But even more exciting are the health and stamina benefits I’ve gained! Not to mention becoming more self-confident in who I am and my abilities, enabling me to get my focus off myself and onto helping others! I love who I am, and my T-Tapp journey has helped me not only physically, but emotionally and spiritually as well! Please let me know if I can help–I would love to assist you on your journey to health and wellness–body, mind and soul! Contact me…I’d love to help you!